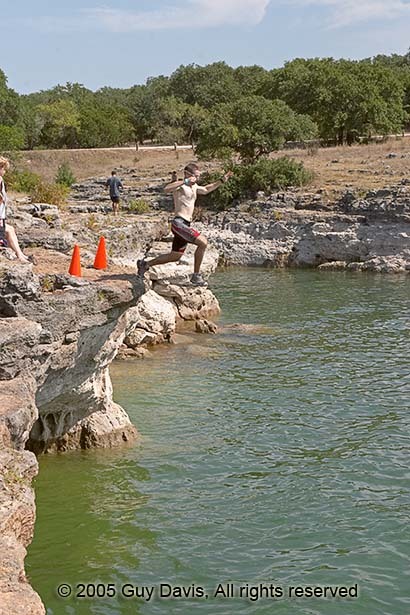 Twenty teams showed up for Too Cool's "No Sweat" 24 hour race on Lake Travis. Team Vignette consisted of Jason Mittman, David Bogle, Karen Burks, and Kipley Fiebig (that's me). With the high temperature forecasted to rise above 100 degrees, it was quite unlikely that there would be "No Sweat" during this race. 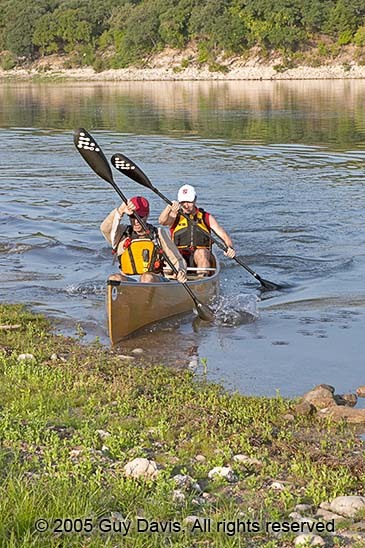 The race started at 8am Saturday with a special test, where two team members had to paddle to a point on a peninsula, while the other two had to run there. At the checkpoint, the paddlers switched with the runners, and everyone returned back to the TA. Next up was a bike to Pace Bend State Park. Once in the park, we were told to drop our bikes, and we received additional coordinates of points inside the park that we'd have to get on foot. Each team was allowed to skip any one checkpoint of their choice during the race. The obvious strategy would be to save your skip point for later on, so in case you came across a difficult point, you would have a safety buffer that would allow you to simply abandon it without penalty. But we decided to be a bit bold, and skip checkpoint 4 right off the bat, as it was the farthest point out on this trekking section. We figured we'd save our running legs for later, and hopefully secure a comfortable race lead right from the start. This plan might of worked if I hadn't accidentally lost track of which points we still had left to get... I managed to overlook CP 6 during our trek. Oops, well, nothing to do but head back into the park and pick it up... at least it was much closer to the bike drop than the skipped CP 4. Back on course once again, we returned to our bikes. Before we could bike away, we had to do a short "snorkelteering" section, where we had to find 4 points underwater, along the edges of a cove. We had to find the points in relay fashion, where only one team member could be in the water at a time. The points were several feet underwater, requiring us to dive down to punch them. Oh, and the entry to the cove was a leap off a small cliff. Fun stuff. We finished that and headed back on our bikes. We were in the lead, but Team Dead Reckoning had been right behind us at the snorkelteering section. There was one point to get on the bike back, where we had to memorize a banner. Unfortunately, I'd plotted this point all wrong, as I had accidentally used my 1:15,000 scale plotter for this point (as I'd brought along a larger scale map just for Pace Bend Park). So, after biking all the way back to TA, we learned that we had to bike back out to get the banner point again. Too bad we'd already wasted our skip point on CP 4... that strategy wasn't looking quite so clever now. On the way back out to recover from my plotting mistake, we saw Team Dead Reckoning and Team Werewolves of Austin biking in, so now we'd fallen to third place. 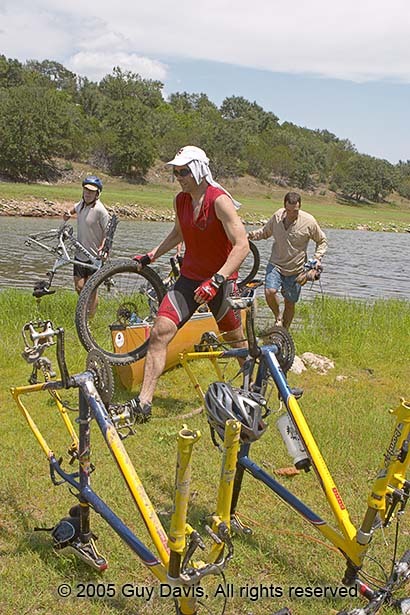 For the next leg, we had to transport our bikes in our boat(s) across the Pedernales River. Also, half of our team would have to swim the river instead of paddle. Jason and Karen swam with fins, while Dave and I paddled the boat. We reassembled the bikes on the other side of the river, and rode/pushed them up the long hill to the ropes section. Team Texas Rough Riders passed us on the uphill with their bikes, so now we were in fourth place as we waited to get on the ropes course. 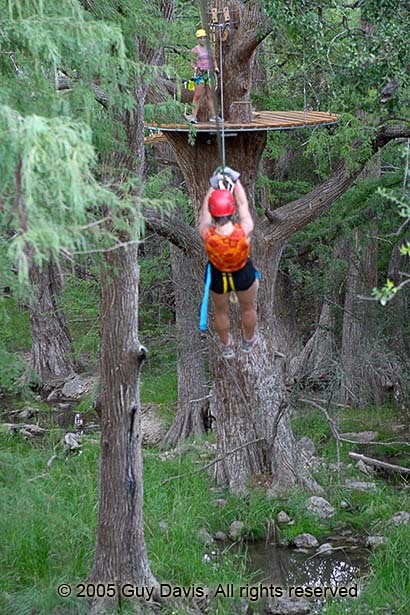 The ropes section was awesome... it was a series of zip lines and rope bridges high up in the canopy of the trees. Truly spectacular stuff. Not to mention a nice break from the heat! But the break was over too quickly, as we set out on our bikes again for Muleshoe Park. The blazing sun turned the asphalt road into a furnace, and we were all pretty wiped out by the time we hit the park. Jason in particular was crashing pretty hard, so we stopped to rest for 20-30 minutes at the park entrance, pouring water over Jason with a hose to help him cool down. Some friendly concerned campers came over to help, and they gave us a ton of ice and cool drinks to help the cooling process. Thanks, anonymous friendly people! Eventually, Jason began to feel better, and like the trooper he is, he insisted that we keep going. The checkpoints on Muleshoe were located off the bike trails. Clever navigation allowed us to skip large portions of the trails to go directly to the points. With Muleshoe cleared, it was back to the roads, and then out to a farther, smaller park to get three more points. This park was harder to clear, as we had to push our bikes to most of the points instead of riding them, but we completed it without incident. Biking back to the boats, we saw the Texas Rough Riders sitting in the shade on the side of the road. They were dropping out because one of their teammates was having severe heat issues, and waiting for a vehicle to pick them up. They would not be the last victims that the sun would claim before the race was through. Just before the boats, we ran into Robyn (co-race director), who told us that for the return trip across the lake, they would transport our bikes for us. All we had to do was paddle back, and nobody had to swim this time. Cool! Back in TA, we were surprised to learn that the former race leaders, Dead Reckoning, had also abandoned the race due to the heat. So now through simple attrition we had jumped back up into second place. And the first place team, Werewolves of Austin, was still in transition! Suddenly being in a position to capture the lead got us pumped up again. And with the sun going down, it was finally cooling off a bit, and we were all starting to feel better. We quickly plotted the points and prepared to give chase. The last leg would be a long paddle up Lake Travis, to three separate areas where we would dock the boats, and do short treks to pickup the final groups of checkpoints. We took off after the Werewolves, and with our faster boats we were able to catch them on the water before too long. Our teams exchanged the usual pleasantries, and then we continued paddling to Muleshoe for the first set of points. We hiked to them all easily enough, then paddled across the lake to get our second batch on the north shore. This section of land nav was the longest of the three, but we completed it without error, and we were even still able to keep up a good jogging speed. When we got back to our boats from this section, and saw that there still weren't any other team's boats docked there, we knew we had the race wrapped up. The final land section came after paddling partway back to the TA. There were two more land points to get here, but we just got the easy one and decided there was no reason to get the second difficult one, as we knew from what we'd seen that no other teams would have time to clear the entire course before the 24 hour cutoff. So, as the sun rose on Sunday, we paddled back to the finish line, amazed at our unlikely comeback. We'd made plenty of silly mistakes, and had almost been shut down by the unrelenting heat. But simple stubborn perseverance, and stopping to take care of ourselves and cool back down at the right time, not to mention a wee bit of luck, was apparently enough to get us back into the game. Thanks to my wonderful teammates for always wanting to keep moving forward, even at those times when it was more brutal than fun. Also thanks for having positive attitudes when we realized my stupid mistakes meant that we'd have to go back on the course to do more unneccessary distance. Y'all rock! And finally, thanks to Art and Robyn for putting on another great race, with cool special tests and real navigational challenges.